Upon receiving that flimsy piece of squared paper, I casually glanced at its serial code. I was looking for the so-called lucky or unlucky numbers, not out of superstition mind you, but merely, as a habit formed after years of receiving meal coupons ever since my enrollment in the elementary school. In that same half-dazed state (not being a morning person), I folded the meal coupons into halves twice – showcasing my slightly OCD tendencies as I fold and refold to achieve a perfect square. If I am slightly more awake, I would be a little more adventurous and attempt origami with it, beaming in delight as I successfully fold a lotus. 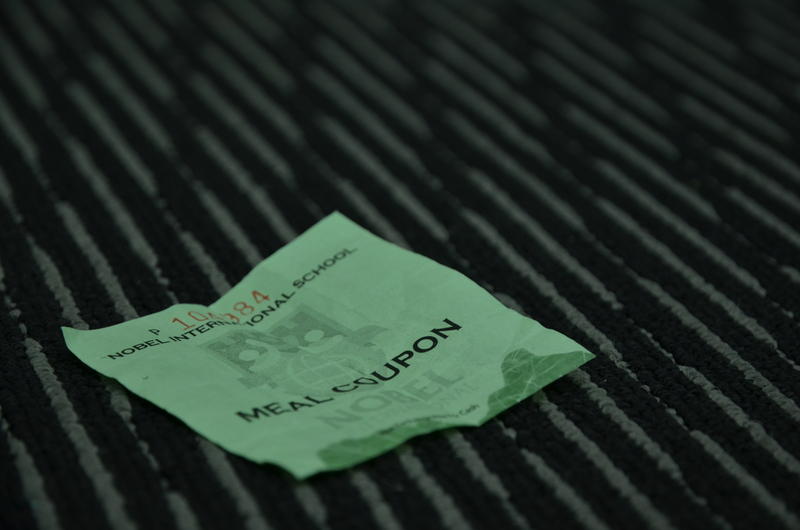 Then, I would carefully place the meal coupon in my pocket – in hopes of it remaining there till lunch time. However, the meal coupons I received that day seemed to have ninja-like tendencies. I have ICT lessons before lunch on Tuesdays and Thursdays, and when I checked for my meal coupon on those days I could verify that it was still safe in my pocket. However, when lunch time rolled around, I reeled in horror when I found that my meal ticket was gone! What dark sorcery* is this? What had caused my meal coupon to go missing? Also, why only the meal coupon? My pocket still held my locker key, yet it did not decide to elope with the meal coupon, neither did the pen I kept in my pocket. Perhaps having such a flimsy square was a mistake. It could have fallen to the ground and no one would have noticed. Has anyone thought about the environmental impact it causes? Sure it is just a small piece of paper – but multiply it by the number of students in school and the number of schooling days. Not so small bit of paper anymore is it? Of course I could have put it in my wallet. However, you are asking the girl who forgets her wallet on the canteen table, let alone carrying one more item to classes? Okay, I do not really leave my wallet on the canteen table anymore but you get my drift. Therefore, if anyone else shares the woes of losing their meal coupons or having meal coupons, look for Sean Ng of 10B. Sean is currently collecting signatures and opinions of students who agree about the hassles of using meal coupons as a survey for his Character Transformation project in a bid to improve the meal coupon system. Even if you do disagree, go to him anyway and give him feedback. Your opinion matters to him. *Exaggeration for comedic purposes only. I do not truly believe ICT class holds any dark secrets what-so-ever. Honest.